It was a perfect day for Archtober-ites to walk onto Pier 2 at Brooklyn Bridge Park and engage in an enlightening tour of its creation, from concept to completion. Kait Kurs from Maryann Thompson Architects began at the entrance—the threshold that separates the big city and pier. It is what makes Pier 2 an island of recreation that includes playgrounds, picnic areas, an inline skating rink, and courts for basketball, handball, bocce, and tetherball. Essentially, it is a “toy box” for the larger park. The pier was originally built by New York Dock Company in the 1950s and operated by Port Authority of New York & New Jersey. Kurs mentioned that the team found bullet casings and black burn marks on the concrete when they started working on the project – remnants of the Port Authority police training. 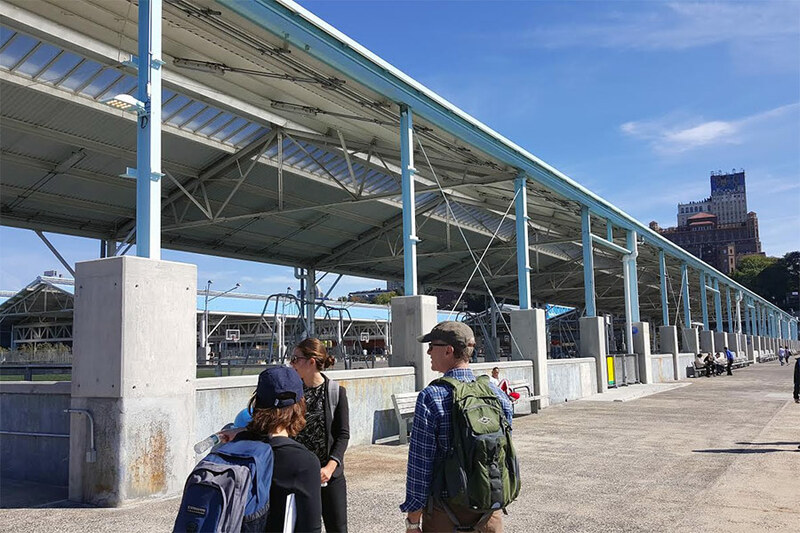 Instead of tearing down the pier and its history, the team chose to adaptively reuse the existing building as the most profound form of recycling. The columns and roof structure were refurbished, but all the walls were removed to bring bright light into the interior. For additional support, large box trusses were added without disturbing the existing form. Polycarbonate skylights inserted into the gables cast a diffused light across the site. Subtractions of roof create voids of sky and open views of Lower Manhattan. The industrial look has been maintained to reference the pier’s past use and landscape. Among the biggest challenges in creating the pier were its drainage system and program. The drainage system was solved by creating a water tank below the entrance to the pier. As for the program, a horizontal layering was used as an organizational strategy for the dispersion and sequence of programming. The space is negotiated with a series of full-height, stainless-steel screens that partially contain “interior” programs, yet allow a visual transparency. Picnic tables are interspersed with various sport courts, alternating between spaces of activity and rest. 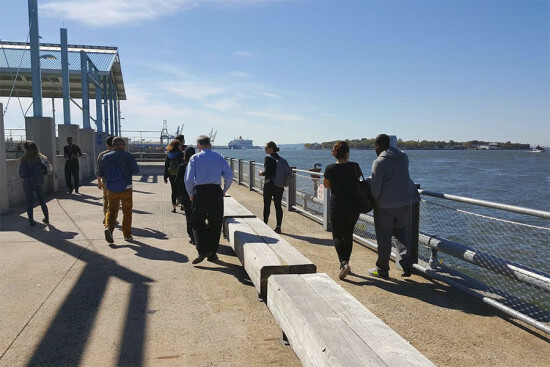 Apart from that, the perimeter of the pier is a 30-foot-wide promenade that offers magnificent views of Lower Manhattan and the New York Harbor. Pier 2 is a much-needed paradise within the bustling city. Archie Srinivasan is an Archtober Coordinator at the Center for Architecture.